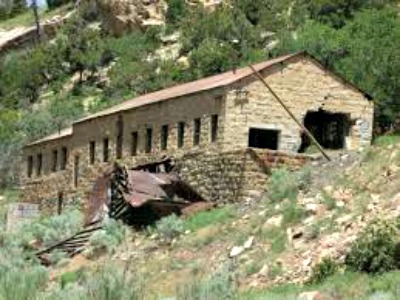 Spring Canyon was a coal mining town in the hills of Carbon County. In 1912 a man named Jesse Knight purchased 1600 acres of land and started to build a mine and supporting town. The town was originally called Storrs after the mine superintendent but this was later changed to Spring Canyon in 1924 after superintendent Storrs was convicted of mail fraud. The town was extremely productive and between the year of 1924 and 1943 the mines produced around 1000 tons of coal a day, and during world war 2 this peaked to 2000 tons a day. Since Jesse Knight was a strict Mormon he didn't allow any brothels or gambling establishments in the town which kept the levels of crime notably lower than other such towns of the day. The town also prospered from the huge amounts of coal it produced and at its peak had a population of 1000 residents and included such buildings as a hotel, a heated swimming pool and well built office buildings and stores. After the 2nd world war had ended the need for coal greatly decreased and by 1969 the town was abandoned. By 1975 all the buildings in the business district were demolished and today the only remains of the town is the railroad trestle and most of the residential area. Every ghost town seems to be haunted and also has one ghost that's more well known than the rest and Spring Canyon is no different. The whole town is thought to be haunted but the number of ghosts that remain there is unknown as the various paranormal investigation groups who have conducted research there all seem to come up with widely varied answers. The basis for this towns haunting would appear to be obvious, as its no secret that numerous people were often killed from digging out the mines with the level of safety equipment and technology they had at the time. Perhaps its the few miners that perished here who are responsible for the glowing lights which can be seen around the town at night, or the unnerving feelings of being followed or watched by an unseen presence when looking around the abandoned buildings. But it is not the miners or the other possible deaths which occurred in the town that have made it well known for being haunted, but instead its reputation comes from a single ghost known as "The White lady". There are many versions of the story's as to why she still lingers here but I shall only tell the 2 most well known versions. The first goes that she was a resident in the town living a happy life with her husband and 2 children until one day her husband and son were both killed in the same accident when working down the mine one day. This left her alone to raise an infant daughter. If this wasn't bad enough the tale goes on to tell how her daughter was then kidnapped and held to ransom for the money she was paid as compensation for the loss of her husband and son. She went to the sheriff for help and this resulted in her child being thrown into a stream and left to drown. Completely distraught at the loss of her family she became more and more depressed until she eventually took her own life. The next story goes how her husband died from an illness and there was no son in the family, and since it wasn't mining related she wasn't entitled to any sort of compensation. Instead of having her baby starve she eventually decided to drown it and then shortly afterwards lost her mind. She was arrested for the murder of her child and institutionalized in a mental facility, which she later escaped from and returned a few years later back to the town were she later died. There are many other stories of her death though which include things such as horse riding accidents and murder and family deaths from landslides, but one things for certain and that's that however she died she suffered a huge amount of pain and has decided to remain in the town. Maybe to get revenge on the mining company or perhaps to find the people who kidnapped her child. Whatever the reason she remains she certainly doesn't seem shy about making her presence known. Many visitors to the town have reported seeing her apparition walking through the old streets and even looking out of windows from the various remaining houses of the town, only to vanish upon being approached. She has been described as being the figure of a person being surrounded by a bright white glow, which makes it impossible to make out any facial features. Many people have got photos of what they claim to be the white lady but since most of them appear to be just a glowing orb its hard to say who or what they could be.